The key verses today embody the sin of Lucifer. In the Isaiah verse we see that the once favored angel wanted more than God had given him. He in fact wanted to be God. 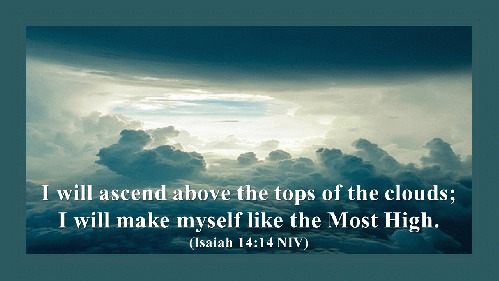 He aspired to ascend to heaven, above the stars of God, and set his own throne on high. For this and the rebellion he orchestrated, he was cast down from heaven. Later, he would offer to Eve in the garden the very same sin -- you will be like God - and she fell just like Lucifer before her. It is not surprising that this sin has been repeated throughout the history of man and through this very day and age. Make no mistake about it beloved. Those who refuse to entertain the notion of God either through atheism or agnosticism simply prefer to be their own god. Unfortunately, many who profess to be believers also prefer to be their own god as well. While most heresies involve the sin of Lucifer perhaps none embodies it better than word faith theology. Simply put, word faith usurps what belongs to God. It usurps the power of God. It usurps the authority of God. Those who have carried it out to its logical end such as Creflo Dollar and Joyce Meyer teach that we are in fact little gods. Those who even go further like the late Myles Munroe insist that God cannot actually do anything on earth without our permission. Yes, you read that right. The above linked article from this week is from word faith adherent Kathy DeGraw who fancies herself a prophetic spiritual warfare strategist. No, that is not found anywhere in scripture but when your entire belief system is unbiblical, why stop there? Let us reason together once more through the depraved mind of a word faith acolyte. "Are you prophesying over your destiny, or are you allowing your destiny to be dictated by everyday life happenings and a spiritual realm that is out to destroy God's will for your life? Where to begin? The first notion offered here is the false teaching that everyone can prophesy and as such we should "prophesying over our own lives." This is of course nonsense. Prophecy is listed specifically as a gift that is given by the Holy Spirit and the bible expressly teaches that not all prophesy. The adherents will insist that this is done as a matter of faith but it takes no faith to speak erroneously for God. Where a false prophet will lie to you about what God has said, Kathy is teaching you that you can lie to yourself as well. Perhaps most ironic is that she cannot even see the logical disconnect in what she has said here. Destiny is something that will happen to us. Now only God knows our destiny because He sees all time but Kathy DeGraw is intimating that you can actually control your own destiny. You can change it but by changing it we lose the ability to consider it destiny! Look how much power she is willing to steal from God Almighty! Not content with displaying a false faith in oneself she now moves into co-opting the Word of God to try and prop up this false doctrine. As soon as she turns to Scripture though she is forced to lie because the Scriptures do not support her.